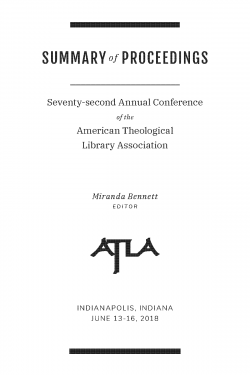 I am pleased to announce the publication of the Summary of Proceedings for the ATLA 2018 Annual Conference in Indianapolis. The Proceedings is the official record of presentations, from plenary keynotes to conversation groups to posters, offered at the conference, with topics ranging from practical tips for weeding your library’s collection to theoretical reflections on students’ information-seeking behaviors. As a fully open access publication, the Proceedings makes the outstanding work of ATLA members and friends available to a global audience, and I encourage you to share its content widely. Having been involved in publications with ATLA for many years, I have been excited to help the Association develop the ATLA Press, including the Proceedings, into a robust collection of resources and to support the creation of a culture of writing among ATLA members. I recall conversations many years ago about ATLA’s potential to become a leader in open access publishing, and I am proud of the progress we have made toward that goal. At the same time, ATLA members have contributed their wisdom and expertise to the profession through writing and editing, and I believe we are gradually transforming our culture of writing into a community of writers. In addition to providing a writing venue in the form of the Proceedings, the Annual Conference now regularly features sessions intended to foster the ATLA writing community. As you make plans to participate in future conferences, I hope you will consider the opportunities they provide for you to develop ideas for writing projects, find writing companions, and give and receive encouragement for writing as part of your professional practice. As the 2018 Proceedings are published, I would like to thank the ATLA staff who worked tirelessly to develop the new OJS workflow and shepherd submissions through it, especially Tawny Burgess and Christine Fruin, and, of course, all the writers whose work appears in it. The Summary of Proceedings can be found here: https://serials.atla.com/proceedings/index. Members, as well as Annual Conference attendees who did not opt-out of receiving a print copy, will receive a printed copy of the Proceedings. Print editions will be shipped this February. Members may also view the Proceedings from 2011 to 2018 at the My ATLA Web Portal under the Members Only tab. Non-members or members seeking additional print copies may order the printed edition at $60 USD for domestic and $80 USD international per volume. Contact an ATLA membership associate for more information on how to order.